Summary: Build a Kite as a competition and judge it on a few different criteria. Recommended Number of Players/Teams: This is best played in teams of three, but if you only have two players, it will also work. Gather materials for each kite and have a bog or box ready for each player or team. If you choose, you can include a set of instructions in the box. 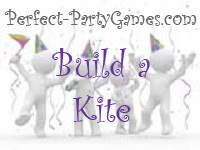 Each player or team must first build a kite using only the materials provided. They must then take the kite on a successful flight. Method 1) Winner can be the first player or team to build a kite that flys. Method 2) Winner can be the player or team who keeps their kite in the air the longest. Method 3) Winner can be based on a combination of points. For example, up to 30 points for sound construction, 15 points awarded for first completed kite, 40 points for kite that flys the highest, 30 points for kite that flys the longest amount of time. Step 5: Take the string and wrap it tightly around the center of your sticks, binding them together. You will be making an "X" shape with the string. Double check that the notches remain parallel to the ground. Step 11: Cut a 2-foot piece of string. Knot one end of the string through the top hole and the other end through bottom hole. This will form the bridle of your kite.